7/8 Cup of Coffee: With a trio of good pitchers lined up, it looked to be an exciting night on the farm, but Matt Barnes, Brian Johnson, and Joe Gunkel all struggled. Deven Marrero kept on raking, and Raymel Flores (pictured) led the Spinners to victory. The PawSox pitching was able to bear down with men on base, and they escaped with a 4-1 victory over the Columbus Clippers (CLE). Matt Barnes went the first five innings, allowing only one run on five hits, but he also walked five and only struck out two. Check out SoxProspects News later today for more on Barnes. Alex Wilson tossed two shutout innings out of the bullpen, and Tommy Layne continued his dominance, striking out the side for his seventh save. The Clippers left 11 men on base in the game. Deven Marrero boosted his average to .409 with the PawSox, going 2 for 4 with a stolen base. Andres Torres led off the game with a home run, and Will Middlebrooks went 1 for 3 with an RBI single. Garin Cecchini went 0 for 4, but did pick up an outfield assist by throwing a runner out at second base. It was a rough night in Binghamton, as the Sea Dogs fell to the Mets (NYM), 11-4. Brian Johnson was roughed up for seven runs on eight hits in only 2 1/3 innings. His ERA rose almost a full run, going from 1.73 to 2.64. Pete Ruiz was the lone Portland pitcher to have success, throwing 2 1/3 scoreless innings with one strikeout. Eastern League All-Star Derrik Gibson went 2 for 5 with a double and a triple, while David Chester and Michael Almanzar each collected two hits and a walk. Salem's comeback fell just short, as they were defeated by the Frederick Keys (BAL), 9-8. It was a rare clunker for Joe Gunkel, as he allowed nine runs, six earned, in five innings. He gave up 10 hits, including a two-run home run that chased him from the game. Kyle Kraus was strong in relief, shutting down the Keys over the final four innings. Mike Miller was on base four times via two hits and two walks, and Reed Gragnani drove in four runs, and was 2 for 5 on the night. Matty Johnson stole his 25th base of the year, and went 1 for 2 with three walks and three runs scored. Salem had the go-ahead run at second base in the bottom of the eighth, but Jantzen Witte struck out to end the threat. Greenville lost a heartbreaker, as the Charleston RiverDogs (NYY) walked off with a 4-3 victory. It was more of the same from Myles Smith, as he struggled with his control throughout the game. He walked four and allowed three runs in 4 2/3 innings. Jacob Dahlstrand struck out five over four innings of relief, but was straddled with the loss after allowing a run to score in the ninth. The offense was led by Carlos Asuaje, who went 2 for 4 with an RBI and a run scored. Manuel Margot singled and walked, and he is now batting .301/.376/.530 over his last 22 games. Making his first start for the Drive, Cole Sturgeon went 1 for 4 with a walk. Lowell improved to 12-12 on the season with a 6-3 victory over the Vermont Lake Monsters (OAK). Randy Perez allowed one run in his five innings of work, walking two and striking out four. German Taveras punched out two batters in two innings, and Carlos Pinales converted his seventh save with a scoreless ninth. Danny Mars and Jordan Betts each went deep for the Spinners, with Mars's home run being his first as a professional. Raymel Flores went 3 for 5 with a double, and Nick Longhi went 2 for 5 with a double. Longhi is now batting .357 with an .864 OPS, and he is more than three years younger than the average player in the league. The GCL Red Sox were rained out yesterday. It was a tough day for the GCL Red Sox pitching, as they were doubled up by the GCL Giants (SFG), 10-5. Jhonathan Diaz picked up his second loss of the year after allowing three runs in three innings. Things got worse from there, as Juan Perez allowed five runs in his lone inning of work, putting the Red Sox in a hole they could not climb out of. Yoan Aybar went 2 for 3 with a triple, pushing his average up to .329. Roldani Baldwin went 3 for 5 with a triple, and Juan Berriento had two hits and scored a run. 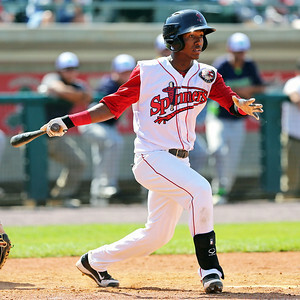 Player of the Day: Raymel Flores went 3 for 5 with a double to lead the Spinners past the Lake Monsters. Flores is now batting .267 on the year, but he is showing a good eye at the plate, walking eight times in 20 games to bump his on-base percentage up to .380. A natural shortstop, he is playing mostly second base with Mauricio Dubon getting the majority of the innings at his normal position. Both are strong defenders, and it will be interesting to see how the two split time going forward.